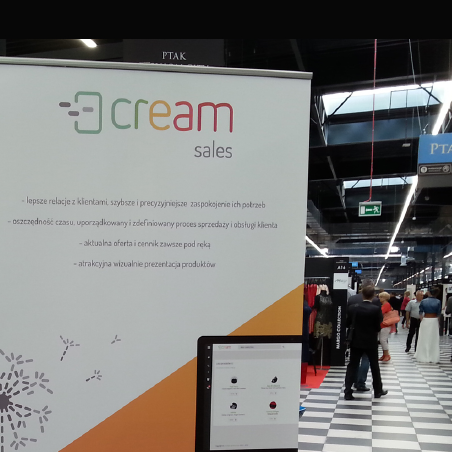 Our new solution for supporting sales process and communication has attracted strong interest of other exhibitors and visitors. The last weekend of August representatives of our company participated in the International Fashion Fair Ptak Expo. They promoted CREAM sales. Our new solution for supporting sales process and communication has attracted strong interest of other exhibitors and visitors. International Fashion Fair were connected with Economic Forum, where hundreds of entrepreneurs and politicians participated. Among them was Waldemar Pawlak, a former deputy prime minister and minister of economy and former President Lech Walesa. International Fashion Fair Ptak Expo was visited by over 100 000 people and 3 500 exhibitors.